In shock and pain after being found in the forest with his face mutilated and most of the skin burnt away, Professor Nugent insists that the American legend of the 'Big Foot' monster is true. A number of horrific incidents are recalled in graphic flashbacks: the brutal murder of a local fisherman, the mutilation of a couple making love in their van, and the Horrendous death of a young motor cyclist. All bear the gory signs of having been butchered by the demon. A group from the University's anthropology class, including the young daughter of the dead fisherman, set out to uncover the mystery. They disturb a Black Magic ritual, and force the truth from a hermit, Wanda. She had been raped by the monster, and gave birth to a mutation. The group are eventually trapped by the demon, only to die in the most gruesome blood bath ever filmed. 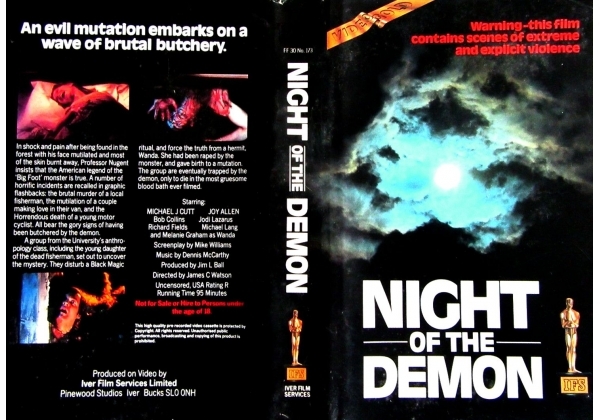 Or find "Night of the Demon" on VHS and DVD / BluRay at Amazon.